Following that exciting bouncing ball all the way to Have a Ball Bingo. It is the premiere online Bingo site making its way and debut before the year’s end of 2013. 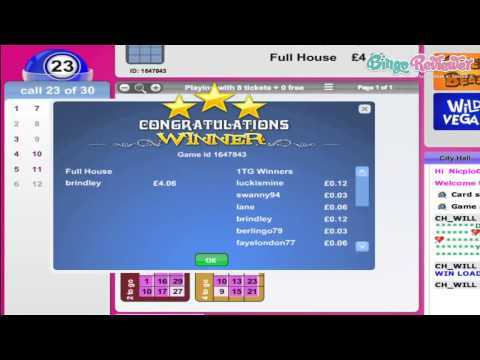 Home of a large selection of Bingo and Casino games and loads of Cash prizes and Bingo Bucks. As far as a color scheme it is what players might expect splashed in pinks, blues and purple hues in soft vibrant glow. The site is user friendly accompanied by tabs for resourceful information that have relevance to all aspects of their operation. The Picture Gallery adds a dimension of a warm community pulled together through photos of roomies. Cozy Games software is a familiar name in the Bingo industry and provides a stellar platform of games. Under this umbrella there are many successful brands that have become the community’s favorite spots to play. iTech Labs tests games for superior performance of the Random Number Generator including fair and honest results. Have a Ball Bingo is regulated and licensed in the Isle of Man. A Superior selection of products are available including four variations of Bingo to choose from. Rooms include Progressive Jackpots offering big cash prizes to luck winners. Side games inside each of the rooms raise the excitement of playing Slots along-side Bingo. Chat Hosts entertain players with lucrative Chat Games awarding Bingo Bucks and other prizes to roomies. Spin your way to fun Slot machines available for real money or bingo bucks. Features include on selected machines: Free Spins, Bonus Games, Multipliers, Wilds, Scatters and more. Casino entertainment is just a click away offering Blackjack, Roulette and Video Poker. A small collection of Scratch Cards add a unique variety to you gaming choices. Unlike some sites that only have a small amount of offers, Have a Ball Bingo has an expansive collection of ongoing promotions that are lucrative and generous. Test drive the site by taking advantage of the Free No Deposit Bonus and play games for Free. This warm hospitality is for all new players registering an account. Certain it will be everything and more you are looking for in an online Bingo site a handsome Bonus on your first three deposits raise your starting bankroll to enhanced motivation. Refer a Friend and the team will show their appreciation by rewarding you with a sweet Bonus. The promotional package is impressive with plenty of offers to satisfy eager players looking for lucrative incentives. The minimum withdrawal limit of £300 per week is below reasonable terms and conditions. We rate Have a Ball Bingo with 3 Pink Hearts. This one's really interesting, being one of the youngest Bingo places around, all the more reasons to check it out. The site looks nice, and for once, you can immediately see all the available Bingo rooms (that you would have to be registered in the first place on most other sites). It's a good thing they are using Cozy Games software, it is one of the industry standards, so no additional downloads, really good looking graphics and in total zero troubles, from the registration down to bonus claim. I was delighted to see that they run 75 and 90 ball rooms, but also 80 and 30 ball rooms, so you get all the Bingo you can imagine right there. You will probably spot the huge 750% bonus claim, and just be aware that it means 200%, 250% and 300% on your first three deposits. You do however get a £15 BB's just for signing up, and that's great because you can test run the rooms without making a deposit. I really like the way this site is set up. Right on the homepage, they give you a list of their rooms as well as the times in which a new game is starting as well as the prize that is up for grabs for each particular game. This is nice and convenient for me and allows me to get started playing my favorite games as quickly as possible. Another thing I like about their homepage is that they list the latest bingo and slot players. I guess I am such a fan of it because I was lucky enough to have my name up there once! They start you off with a nice welcome bonus to start, including some free cash and other deals. I was very impressed with their selection of bingo here as they offer a bunch of different variations to choose from including 30, 75, 80 and 90 ball!